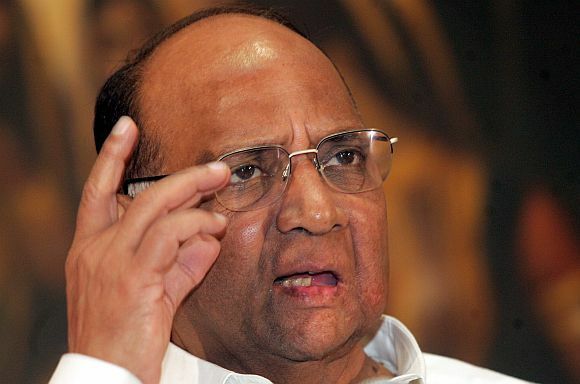 Nationalist Congress Party chief Sharad Pawar on Friday said his party should get more seats to contest in the assembly elections in Maharashtra as the position of its ally the Congress has weakened in the state, as evident from the Lok Sabha results. "Last time, when we got less seats than the Congress in Lok Sabha polls, they said they should get more assembly seats to contest. We should remember it this time when we sit to discuss seat sharing," he said. "We should not lose time in finalising seat sharing with the Congress and start preparations for assembly polls," Pawar said while addressing a meeting of party functionaries in Mumbai. "While finalising seat sharing we should remember that we have won more seats...our position has improved," he said. Outgoing Union minister and NCP leader Praful Patel said Manmohan Singh's failure to assert himself and the complete breakdown of political dialogue with allies led to the rout in the Lok Sabha polls. Opponents succeeded in the conspiracy to malign the Congress and the UPA, Patel said. The PM wasn't seen for two months and it was Rahul who led the campaign, he said. There was no PM-post candidate he said. The political discourse (among allies) which was there in UPA-1 wasn't there in UPA-2, Patel added. During the last assembly polls in 2009, the NCP had contested 114 seats compared to 174 by the Congress in the 288-member House. In the recent Lok Sabha polls the NCP won four and the Congress two seats in the state. Pawar also lamented that despite decisions like food security act it is a reality that we did not get the success we ought to have got. There was a seven-month delay in implementation of the scheme in Maharashtra, he said. He also mentioned decisions like the Rajiv Gandhi health scheme and provision of low interest loans, which failed to enthuse voters. "We will have to go into the causes. We have to go to people. We have to avoid vulgar display of wealth. We have to foster commitment to people afresh," he said. After June 15, party leaders should go to districts and hold rallies and meetings with various strata of the society, he said. "Social reformer Shahu Maharaj said the government has to be for the people. We have to commemorate the deeds of such great people. If development does not have social integration aspect to it lacks something," he said. "The polls have showed that some sections have gone away from us. For example traders were annoyed with LBT (local body tax). The other was issue of Maratha reservations. Effort should be made to implement this without affecting quota for others," he said. Pointing to the success of Mamata, Jayalalithaa, Naveen Patnaik and the Telugu Desam Party and Telangana Rashtra Samithi, Pawar said it seems the people rejected those who were with the United Progressive Alliance. Exclusive! Rahul to be told: Improve or get lost! Anger is building up within the Congress! Did Sharad Pawar just encourage bogus voting?